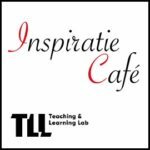 The Teaching & Learning Lab organizes every second thursday of the month an inspiration drink. Alternately a story of a teacher, a student or an interesting education tool is offered. But above all, there is room for exchanging thoughts with colleagues about education while enjoying a bite and a drink.